Updating our earlier story on the recent crackdown by the regime ... trade unionist Felix Anthony has been placed under a curfew. Anthony is not supposed to drive and can only go from home to office and vice versa. No other business or pleasure. The Trade Union Congress stalwart was taken into custody and beaten in a recent sweep by the military goons. Meanwhile, the former Cabinet Minister, Sam Speight, has told the newspaper, The Australian, he plans to apply for a protection visa. Speight, who is also known as Samisoni Tokinisau, escaped to Australia after he was beaten by the military goons for distributing Suliasi Daunitutu's anti-regime DVD to villagers. The president of the National Farmers Union, Gaffar Ahmed, is another seeking refuge in Australia. Ahmed was beaten when Bainimarama was visiting the Ba sugar mill a few weeks ago. The reason? For saying the regime was "fooling the farmers by not telling them the real situation of the mills." Ahmed is now in Australia, where he is believed to be seeking medical treatment. 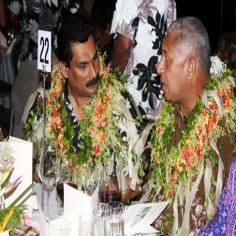 COSY MOMENT: Felix Anthony with Bainimarama at the opening of the Intercontinental Fiji Golf Resort and Spa in 2009. FARMER'S MEETING: Gaffar Ahmed (centre). Frank is fearless, for now ! No protection visa for Speight in Australia !! We're packing him off to fiji. He lied and exagerrated his injuries !! Hi Sam, it is me again. You can forget returning to parliament son. The likes of you are the cause of the current impasse in Fiji. You were a minister in the LQ govt. Tell the Australian media what you did and what you and your govt were planning to do while in govt. Have a great time in Qld. Make sure you visit the state library there and read up on "Democracy", as it means much more than a tick on a piece of paper. Four years after staging the Coup, they are still bashing people up. You'd think that they would have figured out by now that, that's not the way to solve problems. I guess the good thing from our point of view is hopefully the Indians will wake up to the fact that a coup doesn't help anybody, Fijian or Indian. Another question is what's happened to Naivalurua? How come the Police won't charge these goons for assault? Sa qai tu na da. Fiji is becoming libya of the pacific. Bani and AG taliban holding in power and getting rid of people that oppose them. Time will come they will end up in prison or be a loner like rabuka. Felix keep the heat on and fight for the people. All other fijian leaders are quite now. Dua na siga.. Dua na siga ... - Mataivalu ni Solisona. Organise yourselves to have a credible person approach the Unions and other International Organisations to bring this Regime to its knees. Instead of running around like chooks with their heads cut off. A concerted, well executed effort is what is needed now. soon you mates in the Regime will know just what a true Democracy is all about ! To Joe Blow re: 3rd comment on this article. You still can't get it thick head. Sam and other legally elected SDL Ministers have been cleared in the Court of Law. Your bitterness and pay back method will get you, Frank and whoever thinks like you nowhere. Power to the people of Fiji will be restored. The time is coming. SDL party will come back better and stronger. Mark my word! Reconciliation and asking for forgiveness is one thing, they must still serve their time for all the injustice and crimes when the time comes. There's so much blood on VB's hands to even grant a pardon. No amnesty, no immunity. 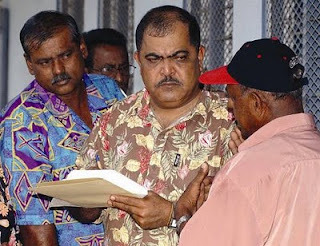 Reconcile and ask for forgiveness from all the people will solve Fiji's problem!!!! Oilei na oiyawe??? Looks like this blog is full of SDL supporters. Mark Manning thinks LQ govt was democratic. Yes, and a big NO. Perhaps we have a PER in place because of the likes of Mark. NO ONE SHOULD SUPPORT THE COUP. I WAS FOOLED LIKE OTHER PEOPLE IN FIJI. I FOR ONE WILL NEVER SUPPORT COUP AND PEOPLE SHOULD PAY FOR THE INJUSTICE THAT HAVE BEEN COMMITTED. SDL/FLP /OTHERS WERE ELECTED MP AND THAT WAS FIJI VOTERS CHOICE. ;ET GET THIS STORED AND CONVINCE THE UPPER/LOWER HOUSE AND THE GCC. THE COURT GAVE ITS VERDIC. "Perhaps we have a PER in place because of the likes of Mark." So the PER is to protect Frank from Mark Manning who is living overseas? This indian supported coup has failed so badly even the indians are now being bashed. What goes around comes around eh chodo and the toady vayeshnoi? Wow, a PER just for little old me ? Thanks ! The only solution to Fiji's coup culture is the Rule of Law and the appropriate punishment from the Courts ! COUP WILL STOP .WHEN FIJI GOVT WILL DISBAND THE ARMY. WE SENT ALL ARMIES TO THE VILLAGES AND THEY SHOULD START FARMING. BETTER MONEY AND THEY CAN USE THEIR POWR IN FARMING NOT HITTING FIJI PEOPLE. "likes of Mark", ie SDL supporters. With a head & CV like that - Anthony would be a welcome addition to Australia's multi cultural society. Far right would welcome him with open arms - view him as godsent. Not everyone who sees the reality in Fiji is an SDL supporter. You just prefer to think that because it makes your justifications so much simpler.